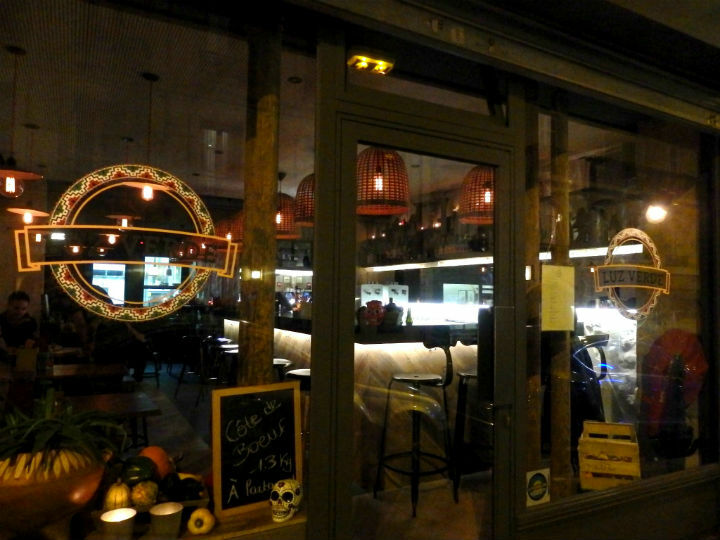 Luz Verde has only been open for about a month but this place has already got quite a following and is the talk of the town amongst the trendy Parisian crowd…so obviously I had to check it out! As these places get packed around 8pm I called up a friend and suggested we meet after work at 7:30pm, to be sure to get a seat. As expected, the place was fairly empty and we managed to pick a spot next to the window, decorated with Mexican skulls and some peppers and avocados from the kitchen. 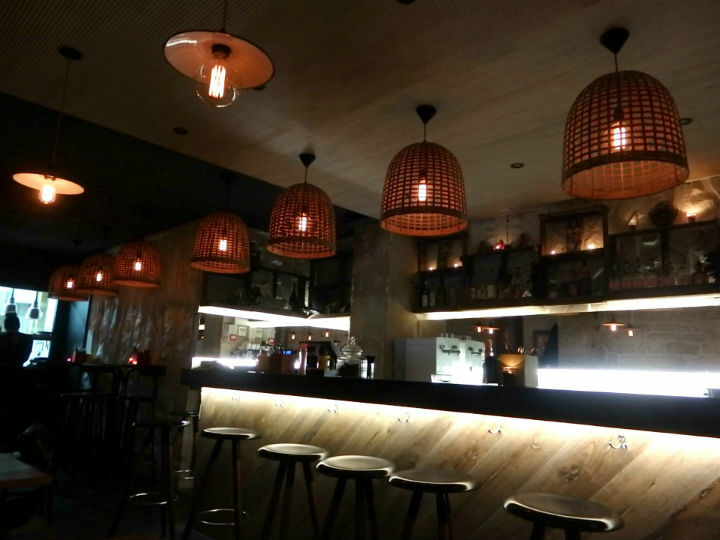 My first impression was very positive: the stone walls blended well with the wooden tables and the long bar, lit with hanging lights that were sheltered with basket-like shades. It was dimly lit inside, but warm at the same time. I also noted that they were playing Raphael Saadiq’s “The way I see it” album, which made me instantly appreciate the place even more (it’s a great CD, FYI). 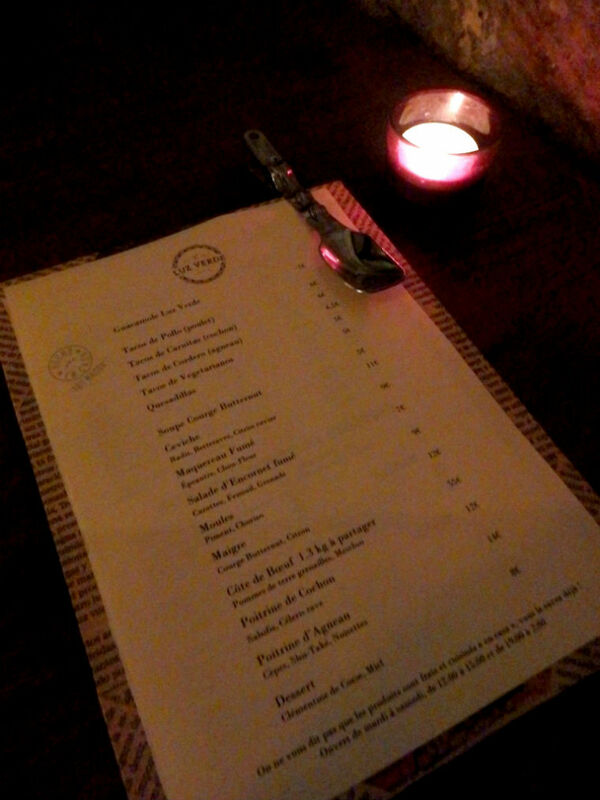 We took a look at the drink menu and saw a list of various French wines and beers (5-6 Euros). I asked the friendly guy at the bar if they had other drinks available (because I had heard they have cocktails), and he informed me that on Saturday they have guest barmen come in and prepare various cocktails but in the week they only offer a frozen margarita (10 Euros). Wanting to do the whole Mexican thing, we chose the margarita, which was fine but came out of a slushy machine and was nothing special, if I’m being completely honest. On to the menu: we decided to share 4 dishes between us (as we are both on a budget), thinking it would be enough and forgetting that in these hip places the portions are always itty bitty! We ordered quesadillas, filled with refried beans and cheese (and that I could have eaten in one bite; 5 Euros for 2), chicken tacos (2 corn flour tortillas filled with spicy chicken, red peppers, corn and onions; 6 Euros), vegetarian tacos (which were super original, with shredded carrot and cabbage in lime juice and topped with ricotta cheese and peanuts; 5 euros) and finally the ceviche (11 Euros), presented as a colorful and artistic display of thickly sliced bonito fish (a mackerel-like fish apparently, I had to Google it!) 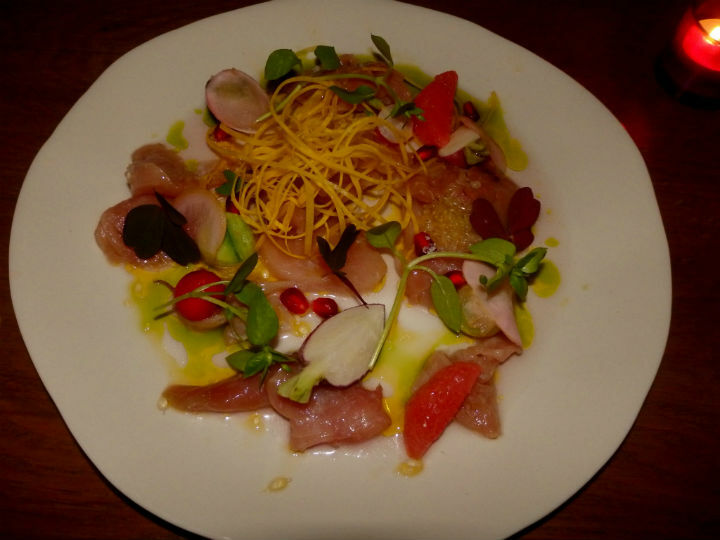 with radish, grapefruit, cucumber balls, pomegranate seeds and shredded beetroot. Super delicious!!!! We suddenly wished that we didn’t have to share, but I guess it made us savor each bite even more! My friend saved the day by noticing a small brown sack on the table that was hidden from my view and that was full of bread. We hungrily ate each slice, wiping up the last bit of vinaigrette from the ceviche and wishing that some sort of fairy grub-mother could come in, wave her magic wand and make more of their tasty dishes appear on our plates. Long story short, we were left wanting more. By this time the place was packed with well-dressed people (and others curiously peering in from the outside) and we had managed to rake up a bill of 47 Euros. So we paid the waiter, who happened to be the Australian cousin of one of the owners and was super nice, and left the buzzing restaurant to step outside into the cold Parisian streets. 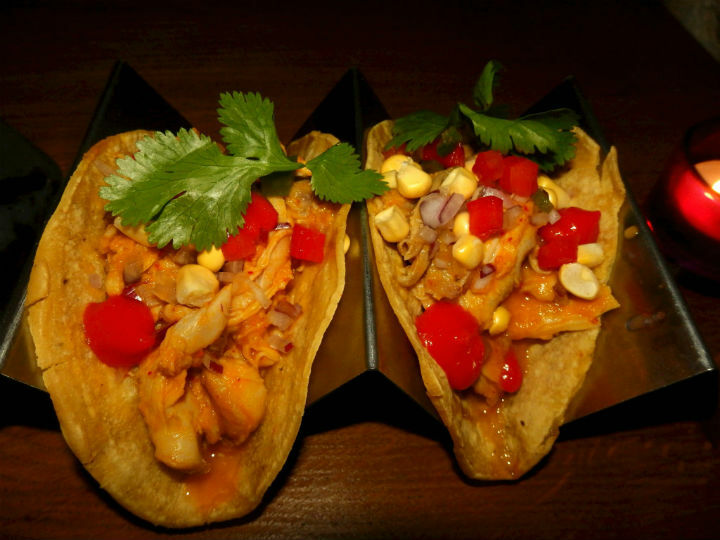 What I learned was this: if I come here again, which I’d like to (as I would love to try all of their dishes), I would not get the margarita, and instead go for a glass of wine and another order of tacos…maybe the lamb or pork ones…*drools*! I noticed they had a 1.3 kg prime rib on the menu, to share, with potatoes and salad, so I’m sure that this dish would be good too. I’ll know for next time! 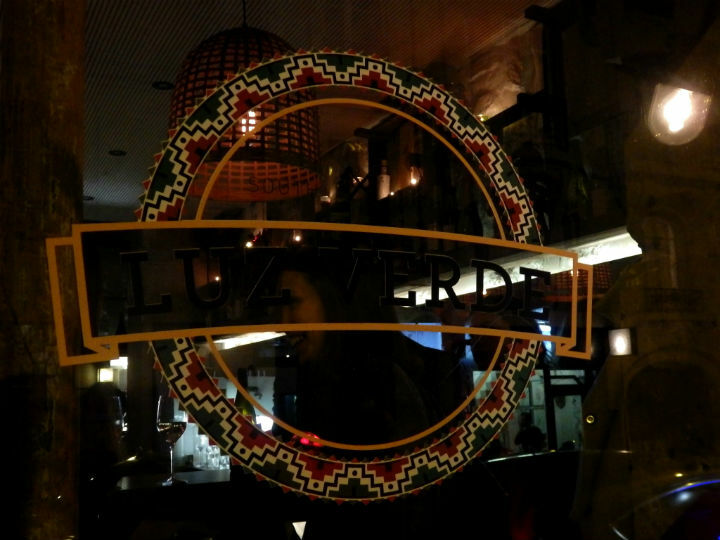 Overall I enjoyed my evening at Luz Verde and think it’s a great place to meet up with friends for relaxed drinks and some light eats. 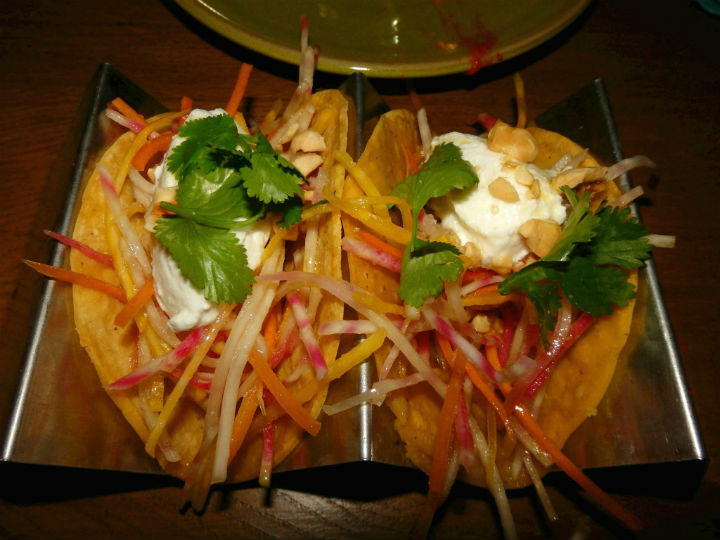 4 tiny but delicious tacos out of 5! 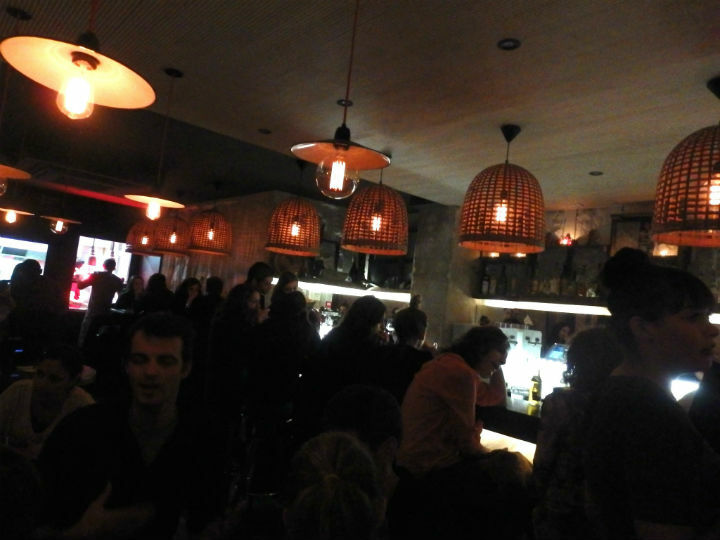 Categories: Uncategorized | Tags: Luz Verde, Mexican restaurant, Paris, restaurant, SoPi, tacos, trendy | Permalink.